I had previously covered a few "Serious Game" projects intended for autism therapy, with the value proposition of helping Asperger Syndrome patients learn to play the game of life. 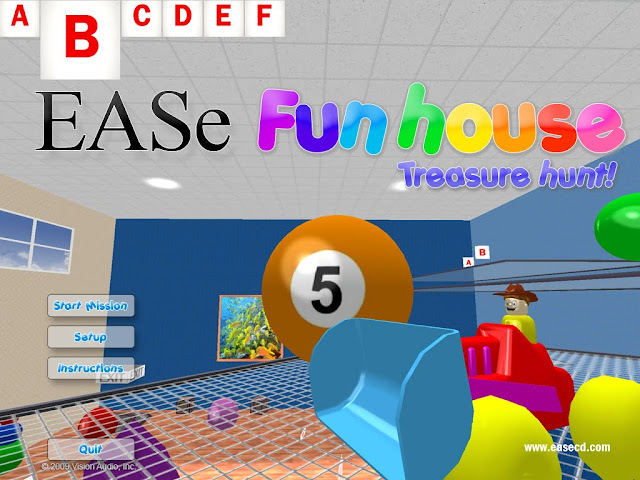 Harvard's School Of Government On "Serious Games"
Now, Vision Audio Inc., a developer of therapeutic games and music for children on the autism spectrum, has released EASe Funhouse, an exploration-based PC game designed to promote concentration and encourage participation in activities. 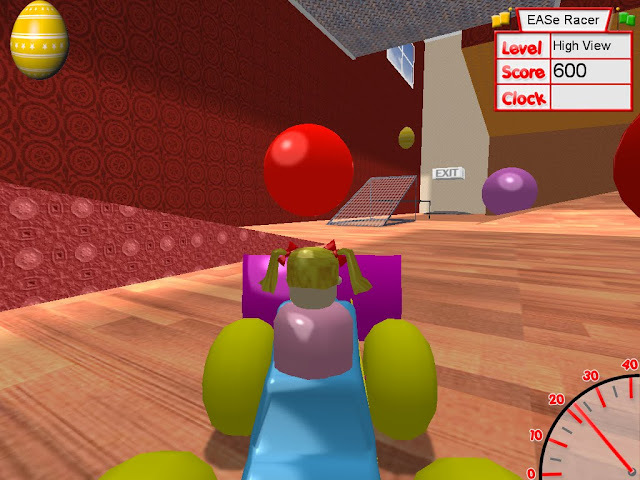 EASe Funhouse puts players in control of a tiny toy tractor in a series of complex oversized environments. Exploration of the game's environments will uncover a variety of therapeutic "treasures" -- flash cards that teach children vocabulary words and concepts such as quantity, color, and facial expressions. Minigames found within EASe Funhouse are designed to challenge a child's concentration and improve his or her ability to follow directions. Vision Audio's therapeutic Electronic Auditory Stimulation effect (EASe) audio accompanies gameplay in EASe Funhouse. According to Visual Audio, EASe products "deliver short, intense bursts of sensory experiences to stimulate but not over-stimulate a child experiencing difficulty with sensory processing and organization." Vision Audio recommends EASe Funhouse for children on the autism spectrum and other children diagnosed with Auditory Hypersensitivity, Hyperacusis, Central Auditory Processing Disorder, or Sensory Integration Disorder. EASe products are inspired by principles of sensory integration and neurological organization taught by Jean Ayres and Glenn Doman. EASe music is encoded according to the principles of Auditory Integration Training from Guy Berard. Sheila Frick's work to connect auditory and vestibular integration inspires the visual/vestibular link, now present in the EASe Games series. EASe products deliver short, intense bursts of sensory experiences to stimulate but not over-stimulate a child experiencing difficulty with sensory processing and organization. This virtual sensory diet creates a palette of experiences to help a child cope with typical environmental conditions. Vision Audio's latest product, EASe Funhouse Treasure Hunt, additionally reinforces organization and attention. It incorporates auditory processing by encouraging the child to listen and follow verbal directions, as well as visual processing by providing on-screen directions to scan the environment to find and collect letters, words, faces and objects. EASe Funhouse Treasure Hunt has six unique rooms, each with a different personality and challenges. 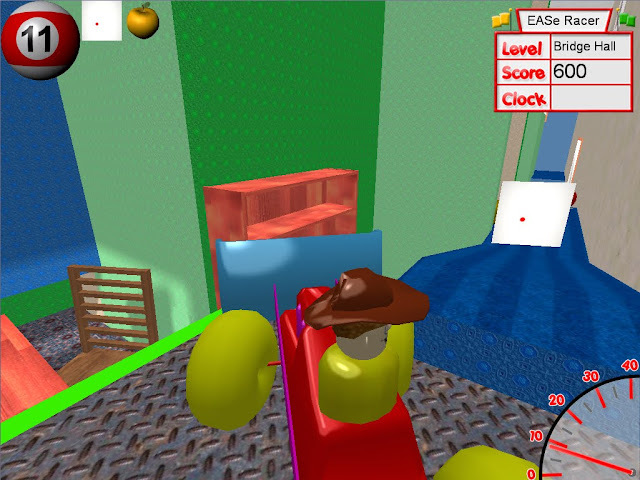 The player controls a tiny toy tractor, a bit like a child pushing the tractor around the floor of a gymnasium. Most things are oversized, giving the sensation of being very small in a huge space. One room is filled with elevators and three levels to explore. Another room has mesh panels that allow the player to look through and down onto a complex environment. Some rooms have ball games stimulating and challenging a child's concentration. All of the rooms are fun to explore, encouraging the child to willingly participate in their own therapy.